Arnold the one-year-old Rat Terrier mix is a happy guy who is always eager to say hello to anyone who stops by his kennel. Since he’s practically still a puppy, he has plenty of energy and playfulness. 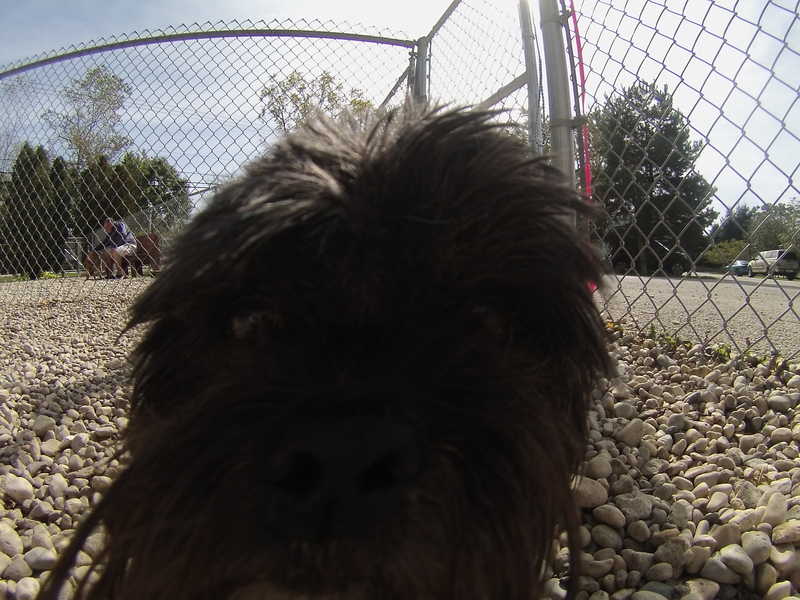 Arnold quickly led the way to the off-leash run and enjoyed being free to romp and roam on his own once we got there. Arnold loves to follow his nose. He would disappear behind the bushes and I could hear him rummaging and snuffling around. Then he would reappear and stop by to say a quick hello before following his nose again on a new scent trail. Arnold could probably benefit from getting more practice with walking on the leash. When I had him out, he was so excited and wanted to see everything at once that he was pulling in different directions. But who can blame him? If you think this little cutie might be the one for you, come in soon to say hi to Arnold! Lucky the three-year-old Pointer mix (not to be confused with the other Lucky) is a handsome boy who likes to be with people. When I sat down on the bench in the off-leash run, Lucky was quick to hop up and join me. He was so enthusiastic about snuggling, in fact, that he tried (unsuccessfully) to fit in my lap. When that didn’t work, he settled for giving me lots of doggy kisses. Lucky was very interested in chasing after tennis balls, but hadn’t quite mastered bringing the ball back so I could throw it again. 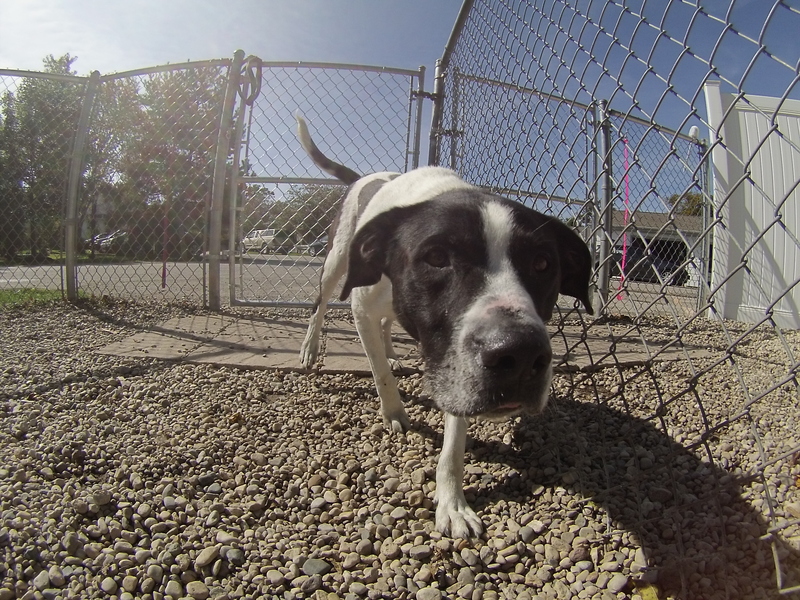 Although Lucky loves people, he isn’t a fan of other dogs and would prefer to be the only pooch in his new home. If you’re looking for a new companion who equally enjoys snuggling on the couch and playing outside, be sure to meet Lucky on your next visit to the shelter! 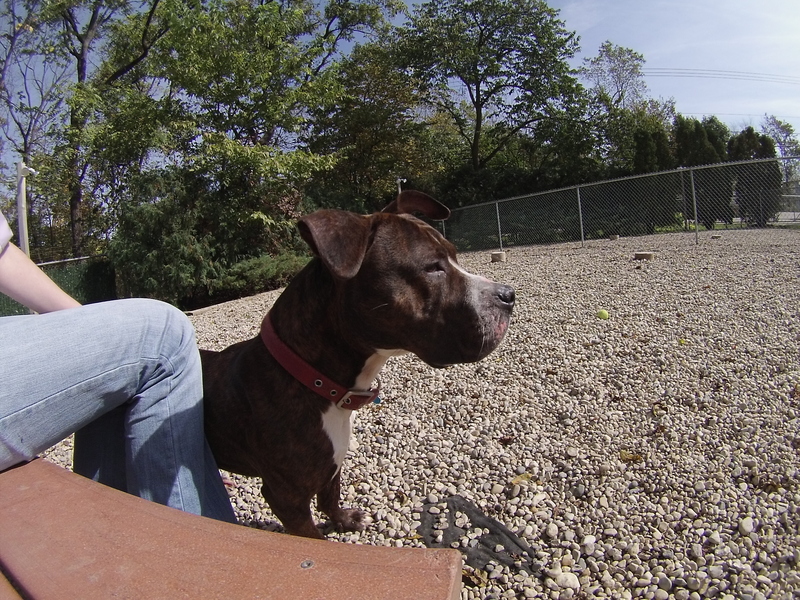 Rambo the one-year-old Staffordshire Bull Terrier mix is such an affectionate guy. As soon as I took his leash from another volunteer, Rambo wanted to give me doggy kisses. Rambo is pretty much all muscle, but he actually wasn’t too difficult to walk on the leash. 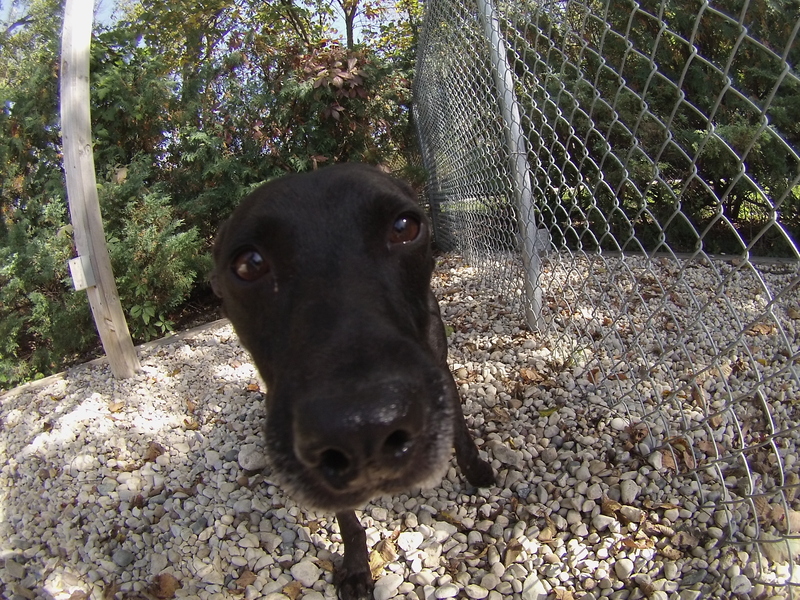 He’s a young pooch with plenty of love to offer his new family. Rambo had a fun time in the off-leash run. He said a polite hello to the dog on the other side of the fence, explored behind the bushes, and paused for a nice drink of water. When I sat on the bench and tapped the open space next to me, Rambo put his front paws up there so he could give me some more doggy kisses. What a lovebug! Stop in soon to say hello to Rambo. Pepper the six-year-old Shih-Tzu/Poodle mix is a little cutie who will look even more adorable after he gets a nice bath and haircut. When I went to Pepper’s kennel, he was sitting in the back corner, looking a little unsure. But as soon as I knelt down, he came right over and rubbed his side against my leg (like a kitty!). The info card on Pepper’s kennel says he isn’t too into snuggling, but if you give him a little time to warm up to you, he certainly enjoys attention. 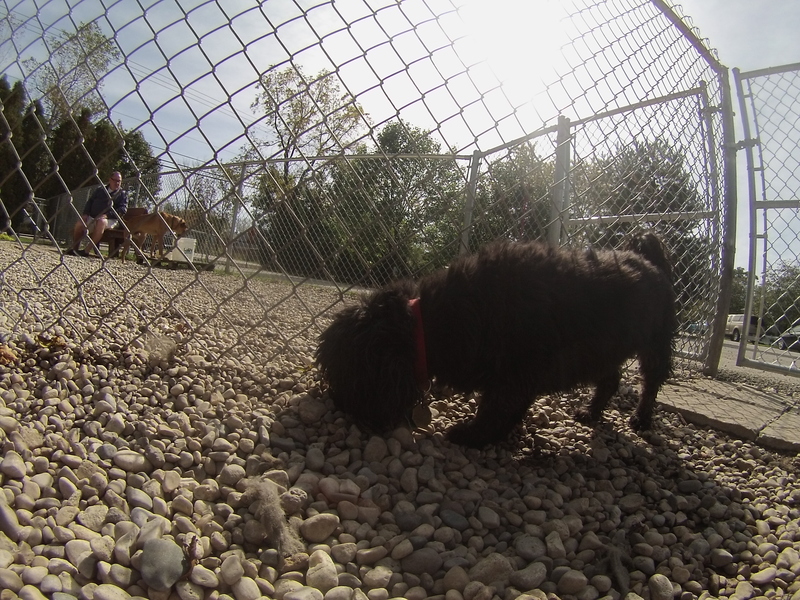 Pepper is currently sharing his kennel with Charlie (see below), so we know he gets along with other dogs. Pepper wasn’t too fond of walking on the leash at first and seemed a little nervous about being out in this new environment, but once we got to the off-leash run he seemed more comfortable and happily walked around. Any time I sat on the ground, Pepper was by my side almost instantly. Pepper would prefer to be in an adult-only home with people who will give him the opportunity to come out his shell and be the happy, affectionate pup he knows he can be. If that sounds like a good fit for you, come in soon to meet Pepper! 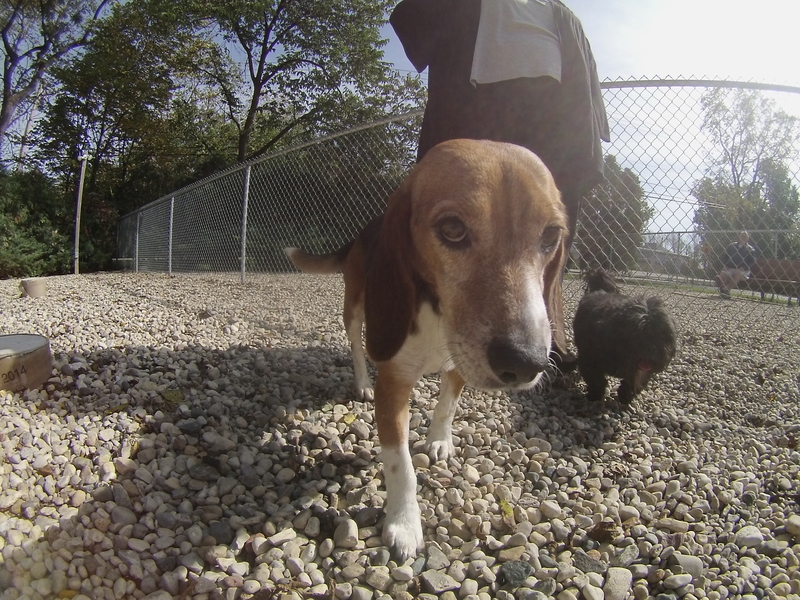 Charlie the four-year-old Beagle mix is pretty nervous at the shelter, but he warms up quickly once you spend some one-on-one time with him. Unlike his kennelmate Pepper (see above), he was more than ready to head out for a walk on the leash–luckily he was there to help convince Pepper! Since Charlie is on the nervous side, he’s actually a very easy walking buddy because he moves pretty slowly. Charlie wasn’t too interested in exploring the off-leash run. Instead, he spent his time either standing in my lap or getting pet by a customer (who was trying to convince her husband to get a small dog instead of a big dog). Charlie ended up at the shelter because his former family couldn’t take care of him anymore, which is why he seems so sad. Charlie is just hoping to find his loving forever home, which isn’t too much to ask. 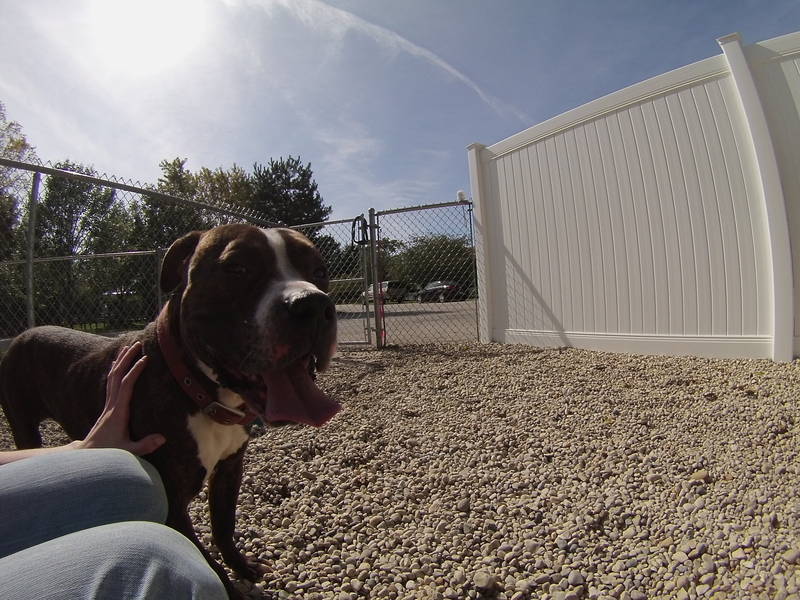 If you think that home might be yours, stop by soon to say hello to Charlie! Help Charlie turn that frown upside down! I also saw Bear, Blush, Cooper, John Boy, Kanne and Osito (Osito was being extra snuggly this week and sitting in my lap), Lisa, Scotty, and Zoey. 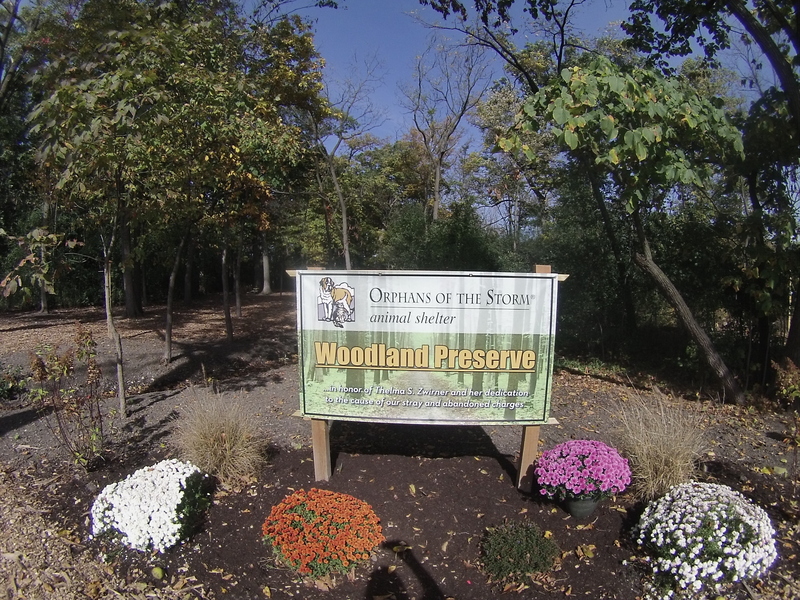 And I forgot to include this in last week’s video with Blush, but here’s a picture of the entrance to the new woodland preserve/walking trail! Autumn is the perfect time to come walk dogs through the forest! Posted by Meet the Pooches on October 16, 2015 in Dog Profiles and tagged adopt, adoption, animal shelter, animals, Beagle, Chicago, Deerfield, dogs, Orphans of the Storm, pets, Pointer, poodle, Rat Terrier, Riverwoods, Shih Tzu, Staffordshire Bull Terrier. can you please tell me what happened to Tulip? I have been keeping an eye on her and haven’t checked in a couple of weeks and now she is gone. Tulip was adopted the week of October 12. If you are particularly interested in Chow mixes, there are still a couple of others available for adoption, like Bear and Weezie. I believe Paxton is still at the shelter (sharing a kennel with Wilson, the other Aussie) but not available for adoption at the moment. 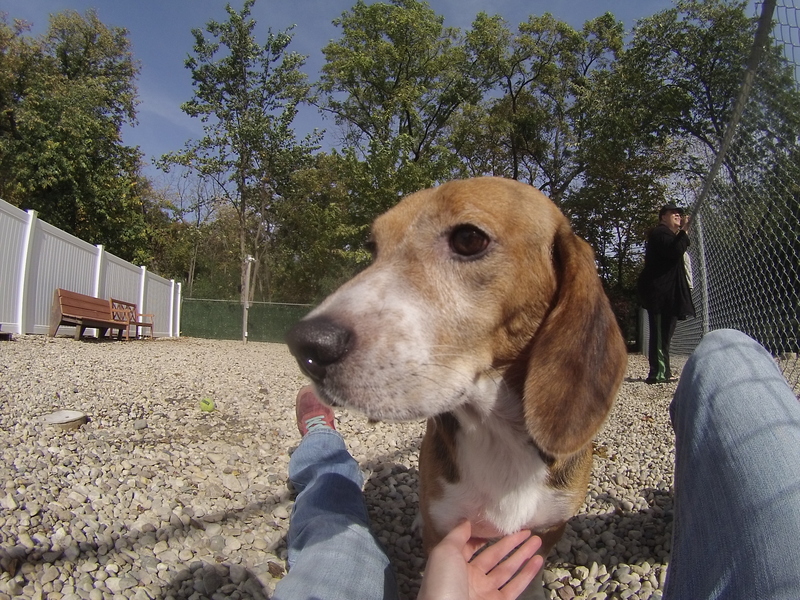 You can call the shelter at 847-945-0235 to learn more about Paxton.